I would like to share a story about the success and determination of a child with Alstrom Syndrome in the hopes that not only that it may not only inspire but assist others whose lives have been affected by this disease. Aside from the physical manifestations of Alstrom’s and the severe medical complications that arise to varying degrees from one individual to the next, one of the most trying areas for us that should not even be, has been the continuous battle for free and appropriate education. I am sure there are many parents of children with Alstrom Syndrome that have been met with much resistance from their local school districts in regards to not only what services and academics they are to provide, but to what their children are capable of as well based upon their impairments. Many districts tend to view their provision of both education and services as a privilege, and not a right guaranteed to all. Before I continue further, I would like to offer some background information as to our history with Alstrom Syndrome. Unknowingly, we have been dealing with the manifestations of Alstrom for close to twenty years, as our eldest son would have celebrated his 20th birthday this August. When I say unknowingly, it is because we did not get a confirmed diagnosis through genetics testing until approximately three years ago, as the gene was not found during the initial testing sequence, and was sent overseas for further testing. We have had seven children, five of which are afflicted with Alstrom, and two of those five whom were taken from us far too soon. Currently we have two in the high school level finishing up their their sophomore and junior year, and one that will be entering kindergarten in the upcoming school year. We have been embroiled in educational needs battles since the beginning years of our eldest son’s education. But that is another story that I hope to share in the future. Our participation in the Alstrom community has been minimal, as I’ve opted to suffer in silence so to speak. But after many years of enduring the atrocities suffered not only by our children, but viewing those endured by other children with disabilities at the hands of the educational system as well, I have begun to see things differently as I feel that I may be able to help those experiencing educational issues. I plan to assemble a blog or website in the future in the hopes that it may be a valuable resource to the parents of a child with a visual impairment experiencing educational issues. A network in which we can discuss problems and solutions, the laws and rights of those containing an IEP, and the innovative ways we are implementing the use of real world technology as a means of not only accessibility, but the way that it has been utilized to improve functional ability. So this is my first step in doing this, and with giving you some knowledge as to our background with Alstrom, I will get back to the original story. I would like to introduce my son Gabriel. Gabe has recently celebrated his 16th birthday. Fortunately for Gabe, aside from the obvious metabolic characteristic, blindness, and suffering from a moderate hearing loss, Gabe is currently not afflicted by the more life threatening symptoms that are currently experienced by his sister, Abigail, who is elder by one year. It’s been a rough road for Gabe both educationally and in other aspects. Gabe entered the school system as the first of our educational battles was coming to a head. He was swept along for the ride so to speak, as both his sister Abigail and brother Michelangelo were both in school before him. I accept the blame that things spiraled out of control to the degree that they had as I was lax, and assumed that the district had the best interest of my children in mind, as they were the educators. I couldn’t have been more wrong. The issue was simple. The district felt that, because the children had varying degrees of a visual impairment, they were compromised cognitively as well. After many battles and many underhanded tactics used against us, the district finally threw in the towel. By the allure of cutting edge technology and services, we opted to send the children to a renowned private institution near our locale. Another poor choice, as the facility was not what it is portrayed to be. But as I said before that is another story. Gabe’s first three years there were wasted, as they did not have an appropriate placement for him as he was more advanced than his peers. Year after year we got the same story of how they restructured their program and unfortunately due to his age he fell in the lower portion. At that point, it again became a battle – a battle to get these children out and back to the home district. Gabe’s placement began to affect his demeanor as he began to become withdrawn. Socially he was stifled as they would not allow him to participate in any activities because of the possible Alstrom diagnosis; therefore he was a ticking time bomb. During this battle, Gabe became even more withdrawn as we suddenly lost our son Michaelangelo to this disease. He had lost his best and possibly only friend. After taking some time to assist in the healing process, it was back to the battle at hand. Eventually, through litigation, we won out. It was back to the local high school for 9th grade. I was extremely concerned feeling that he would be a target so to speak in our local public school, but at the same time I knew that Gabe would have more opportunity here. And I think that by now the district realized that I would make sure that he would get it. But even so, Gabe would still be challenged to prove his merit. 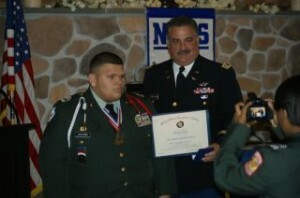 Upon entering high school, Gabe expressed the interest, and lobbied for himself to join the Army JROTC program. Both the senior army instructor and the army instructor were willing to give it a try. They stated that although they never faced a circumstance such as this within the program, that they would make it work. They also stated that they will expect the same of Gabe as they would of any cadet, and that he would be treated no differently. Gabe would not have wanted it any other way. The program is run with a strict military mentality and regiment. The premise of the program is that through leadership and education training one will become a better citizen. It has four years of academics along with physical training, drill team, academic team, Raiders, community service and other various activities. Gabe seemed to have found his niche. He immediately joined the drill team. The drill team competes against other military academies and programs in both military drill and parade, both armed unarmed. His participation in the program was met with much skepticism. He was met with much negativity, but I advised him to remain focused and feed off of the negativity. Gabe remained persistent. He practiced religiously in drill formation. Although Gabe traveled to the competitions with the team, he still was not included in the competition. After a few competitions, even though I tried to keep his spirits up, I could see that being passed up based on his disability was wearing him down. He knew he could do the movements as he practiced. I also had begun to take notice that if I was present at the competitions, they seemed to rely on me to guide Gabe as opposed to incorporating him into the team. I decided then it would be best if I backed off, and sent him to the next competition on his own. It was there, at a critical moment, he took matters into his own hands and entered himself in the armed knockout event at 2nd Brigade Drill competition, in Queens, New York. This competition determines who goes on to Nationals. Armed knockout is similar to a Simon says type of event. The army instructor calls the command, and the cadet must execute the movement perfectly with his body and his rifle. But the preparatory command must be correct in order to execute the movement. The cadet must be aware of the count of individuals that still remain in the event to determine if they are being addressed correctly before executing a movement. Was it platoon sized or squad sized? To this day, I still can’t figure out how he kept track of who was in the event at any given point in time. And these commands are given in rapid fire succession. Gabe placed third in the event, beating out his entire battalion including his battalion commander and took home a trophy. It was after this that some began to view him differently, that he was capable despite his impairment. Gabe has found many other ways to contribute to the program and has ascended through the ranks. He received the rising star award at the JROTC awards banquet at the end of his first year, and had been promoted to First Sargent. This year Gabe participated in Drill Team, Color Guard, and the Raiders team, along with juggling the responsibilities of First Sargent. He also is attending a gym where he is receiving training in both wrestling and Brazilian Jiu Jitsu with the anticipation of going out for the wrestling team this upcoming school year. Most days start with going to school at 6am for practice in Raiders, staying after school for Drill Team practice, and then to the gym for his training, while maintaining his academics. He has juggled this very well, and has maintained second honors throughout the year in regular education classes, just falling short of first honors. As First Sargent, he assumed command of Charlie Company, and was responsible for their upkeep, along with the responsibility of the inventory in the supply room. He gave the other cadets no excuse, because it was felt that if Gabe can do it, then they are capable of it as well. This program has given him a renewed confidence in himself, and he has even begun to network socially. This year Gabe’s hard work paid off. At the JROTC Awards banquet last week, Gabe received a national award from the Military Officers Association of America for demonstrating exceptional potential for military leadership as a member of the JROTC. The picture is of him being presented his certificate, ribbon and medal. It was also announced that he was being promoted to officer status as Captain, the fourth highest rank in the program. He still has two more years to go. It is amazing that all throughout life Gabe has had many doors closed in his face, based upon his disability. Even his start with this was met with much skepticism, and still is at times. But with finally being given an opportunity he has soared with it and surpassed what anyone could ever have imagined he was capable of. His persistence has paid off!